Janet's salsa is an important part of her guacamole. I wouldn't recommend substituting it. 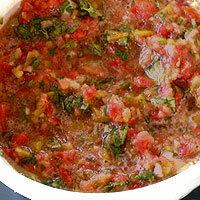 Make salsa first and set aside. 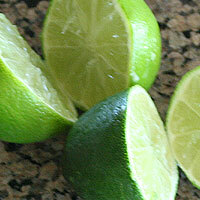 Cut one lime in half and set aside. Mince the jalapenos and set aside. 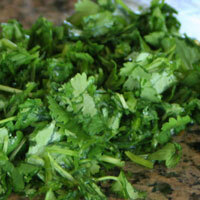 Chop the cilantro and set aside. Cut the avocados and half. Core and scrape the fruit out. 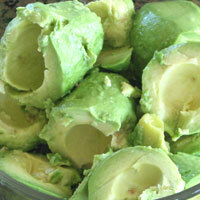 Immediately squeeze the lime juice all over the avocados to prevent browning. Add the fresh salsa, jalapenos, cilantro, salt, and *avocado oil. This guacamole is amazing without the avacado oil, but adding it makes it even better. 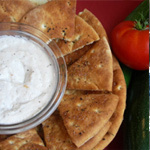 It is best to use avocado oil suited for low heat (salads, salsa, guacamole, etc). I could only find this online. The high heat avocado oil works just fine though if you don't want to buy it online. I found it in a local health food store. Using two knifes slide them across each other like scissors to cut the avocados and mix in the other ingredients. 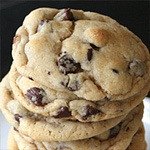 I like a rougher chop like this, but you can also use a potato masher or a fork for a smoother guacamole. Just don’t over-process it. Add more lime and salt to taste. This guacamole is amazing without the avacado oil, but adding it makes it even better. 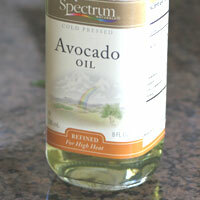 It is best to use avocado oil suited for low heat (salads, salsa, guacamole, etc). I could only find this online. The high heat avocado oil works just fine though if you don’t want to buy it online. I found it in a local health food store. To store, place plastic wrap directly on top of the guacamole, and a sealed lid on the container. Mixing: This guacomole is best roughly mixed. 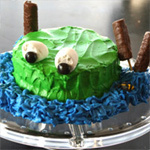 Don't overmix. Browning: Be sure to add the lime juice to the avacados immediately after cutting to prevent browning. 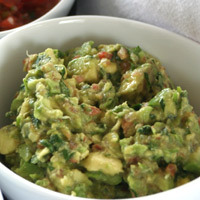 After it is made, store with plastic wrap directly on the guacamole and an airtight lid on the container. The guacamole is best the day it's made, but is still pretty good when properly stored. 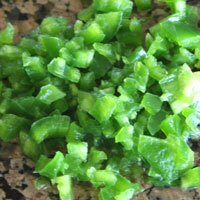 Oversalting: It's quite easy to oversalt guacamole, so add it a bit at a time. It's frustrating to ruin a great batch of guacamole from oversalting. 1. Cut one lime in half and set aside. Mince the jalapenos and cilantro and set aside. Cut the avocados in half. Core and scrape the fruit out. Immediately squeeze the lime juice all over the avocados to prevent browning. 2. 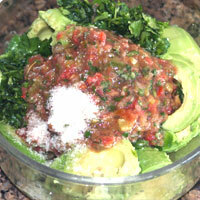 Add the fresh salsa, jalapenos, cilantro, salt, and (1)avocado oil. Using two knifes slide them across each other like scissors to cut the avocados and mix in the other ingredients. 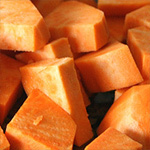 I like a rougher chop like this, but you can also use a potato masher or a fork for a smoother guacamole. Just don’t over-process it. Add more lime and salt to taste. 3. 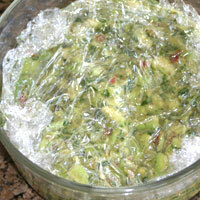 To store, place plastic wrap directly on top of the guacamole, and a sealed lid on the container. 1. 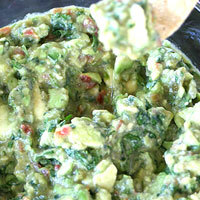 This guacamole is amazing without the avacado oil, but adding it makes it even better. 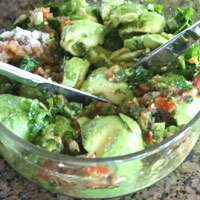 It is best to use avocado oil suited for low heat (salads, salsa, guacamole, etc). I could only find this online. The high heat avocado oil works just fine though if you don’t want to buy it online. I found it in a local health food store.